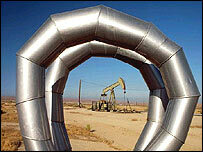 Cairn Energy has again put back the start date for production at its main Indian oilfield. The firm blamed the delay on slower-than-expected pipeline building. The Mangala oilfield should now come online in 2009, rather than in 2008 as predicted. Cairn had initially forecast it would start pumping oil in 2007. However, the company said that the problems would not disrupt its plan to list its Indian operations on the Bombay stock exchange in December. Cairns shares closed 0.4% higher at 2125 pence, after falling as much as 3.8% in earlier trading. Cairn's Indian gas and oil operations make up the majority of its business, and the company said it plans to retain a majority stake following the share sale. Cairn said that strong demand for oilfield services had squeezed the market, making it harder to secure the companies needed to build the pipelines. In order to speed up its development of the Mangala field, Cairn said it was considering taking on some of the pipeline-building responsibilities. On the earnings front, Cairn released a mixed picture on Tuesday. While Cairn's oil reserves were higher than first predicted, it also said that pre-tax profit, excluding exceptional items, fell to $12.7m in the first six months of this year, compared with $48.5m a year earlier. It had a net loss of $5.8m during the past six months.